Wanna put old on hold? 'I am in my late 40's and starting to feel a little tired looking all the time. I have a great skin care regime and take care of myself particularly out in the sun. I also eat well and exercise regularly. I have tried many, many lotions and potions over the years but have never had much success. I have even tried IPL and peels which were good but none really ever get rid of the wrinkles. My friend had a botox treatment done with a lady called Sylvia, and I went along to have a treatment. Sylvia is gentle, and very caring. She treats you according to what you want. I have been to other places where they tell you that you need this and that, and the other and it will cost thousands of dollars. I have now been to Sylvia three times and she is fantastic. I have sent along other friends who have said she is simply the BEST and they have been to many other doctors for treatments for years. Sylvia had her own clinic but now works alongside two sisters in a family run business called The Laser Lounge. The therapists/technicians are all highly experienced professional and friendly. Sylvia is a Registered Nurse with a Master's Degree and works with the cosmetic doctor and specialises in cosmetic injectables of both botox and dermal fillers, which are used for deeper lines and volume loss in the cheeks for example. 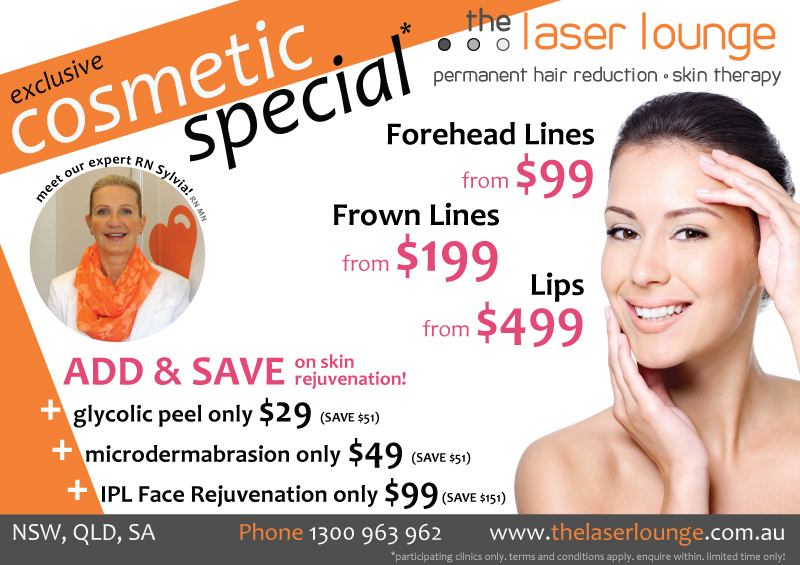 New clients to the Laser Lounge are able to take advantage of a very special offer of $99 for forehead lines and only $199 for frown lines which is very competitive. The results last about 4 months, but after a few times the lines begin to fade as the muscle is not forming the wrinkle and the space between injections can be 6 months or longer. Does it hurt? For a few seconds only. The needles are tiny and Sylvia is very gently and quick. There is usually no mark, but if there is, these are like little mosquito bites that disappear within 20 minutes. Rarely, there may be a little bruising for people who are on blood thinning medication or fish oil. If you are thinking of a treat for yourself and a nice refreshing look for a special occasion or holiday then I would highly recommend Sylvia. I feel fortunate to have been recommended to the best. Sylvia is at Castle Hill Laser Lounge on Tues and Thursdays and Sydney CBD on Wednesdays.